OXFORD, Miss. 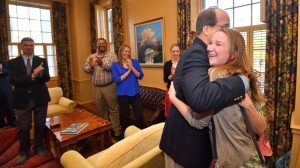 – Every leap year since 2008, a University of Mississippi student has been surprised with a Morris K. Udall Scholarship. This year is no exception, as Grace Sullivan became the university’s third recipient of the prestigious academic award. The junior social work major from Madison got the news recently when she was summoned to Chancellor Jeffery Vitter’s office in the Lyceum. Led to believe that the chancellor was meeting with all institutional nominees for national fellowships, Sullivan had no idea she had actually won the Udall. As the chancellor announced the good news, he extended thanks to her professors, staff members who have assisted her and family supporters. The Udall Scholarship provides $7,000 for one year of study. Previous UM students to be awarded Udall Scholarships are Alecia Waite in 2008 and Taylor Cook in 2012. Sullivan is among 60 national winners of the scholarships, given annually to college sophomores and juniors who are committed to careers related to the environment, tribal public policy or Native American health care. Sullivan is a graduate of Madison Central High School. A member of the Sally McDonnell Barksdale Honors College, Phi Kappa Phi and Order of Omega, she is actively involved in the Associate Student Body, Green Fund Committee, Delta Gamma fraternity, Active Transportation Advisory Committee and Gamma Beta Phi community service honors society. She is also a member of the Ole Miss Cycling Club and UM Garden Club. As a sophomore, she led her sorority’s team in the Green Cup competition, an annual event among Greek houses to be named the most sustainable, culminating in Green Week. Intent on being interactive with members and on encouraging involvement, the team developed a project to reduce transportation waste. As a second project, Sullivan took groups to local recreation trails to pick up litter. Honors College Dean Douglass Sullivan-González said he was pleased, but not really surprised. Sullivan credits the university with developing her leadership skills. Besides her work in the world of environmentalism, Sullivan fosters education and activism for local birds, volunteers at an Oxford nursing home and is a member of the Student Gardening Club, all while maintaining a 3.76 GPA. In her Udall application, she wrote that she hoped “to go into public service in Mississippi, eventually transitioning into a community planning position in which I will encourage sustainable practices as a way to combat social ills.” This scholarship is a sign of Sullivan’s dedication and potential, and will offer unique opportunities as well. One of Sullivan’s mentors is Tess Lefmann, assistant professor of social work. Lefmann said she has no doubt that Sullivan will continue to make valuable contributions to the country’s policies on energy use and environmental sustainability. Sullivan’s parents are Dr. David and Claire Sullivan of Madison, both UM alumni. Congress established the Udall Foundation as an independent executive branch agency in 1992 to honor Morris K. Udall’s 30 years of service in the U.S. House of Representatives. Students interested in pursuing a Udall Scholarship can contact Tim Dolan, the university’s Udall representative, at onsa@olemiss.edu. The Office of National Scholarship Advisement conducts workshops each semester to introduce students to major national scholarships. Go to http://www.honors.olemiss.edu/national-scholarship/ for more information.